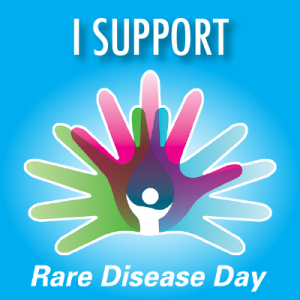 Show support for Alstrom Syndrome International on Rare Disease Day!! YOU are the heroes who will make this happen!! Many thanks for the compliments following our posts about the Precision Medicine Initiative. A few members need to understand that the work is already underway and that ASI has been energetically involved for about a year, so this is real, not a fantasy. More importantly, the actual payoff will begin shortly when you have to dig deep for the benefit of all and complete yet another survey for ASI, this one the all-important Alström Syndrome Registry (ASR) about which we have written several times. In the future we will refer to it as ARC (Alstrom Research Connect & Family Exchange). You, not we, will be the true heroes in this adventure! It has occurred to us that you could help the effort and help yourselves by starting to collect and to recollect your [or your child(ren)’s] experience with the syndrome. Take some notes as you review. What happened when? How old were you? What medications were prescribed for which problem? What dosages were used? For how long? Did it work? Think about how dual-sensory deficits and different health issues have affected all the different areas of your life – home and family, school, community, work? What solutions helped or hurt? The survey is very comprehensive, and the most cool, wonderful, and very important thing about it is that you’ll be able to see not only how other unidentified respondents answered the same question but also see percentages relative to all those who have answered that same question. You can come back over time and compare your personal experience again and again as the number of those participating gets bigger and bigger. And, remember that your privacy is rigorously protected! We all know that Alström Syndrome is rare and that there is a lot of variability and that treating physicians are often working in the dark. Think about going on line and being able to show the doctor right then and there what others with the syndrome have experienced. Also, we’re working on mobile apps and appropriate technology that will be accessible, so think about being able to whip out your phone and say, “Siri, please tell Dr. Knows Little how many Alström patients suffered from glue ear at age 5.” Siri can respond, “out of 832 patients registered, 76% had glue ear at age 5. Would you like more information on this topic?” When we’re done, we’ve been told that 90 % of the entire survey will be computable and viewable, even (wow!) as charts and graphs. What an amazing gift! Also, don’t be worried that this may be just too difficult for you! There will be demos and you can stop (AND “SAVE”) and pick-up where you left off. We have “Guides” in place already to reassure you, and we are developing a team of “Faciltators” who can help you complete whatever you find challenging, even work through the whole process with you, if needed. So, please prepare yourself to move quickly once we are well and truly launched. Do not get discouraged by the size of the task, and remember that you will be personally contributing to one of the landmark developments in Alström Land as well as throughout the global community of those who suffer from rare disorders. Get ready and stay tuned! We are very excited! All the best and thank you in advance to each and all!